** April 2017 – The entrance to this hike from Route 3 is CLOSED until further notice due to bridge work at Interstate 95, most of this hike can be done by doing the Arcadia Trail. For a while now I have been looking forward to this hike. It has come highly recommended by fellow hiker Auntie Beak. Myself and another couple of hikers met up with Auntie Beak and followed her route. This hike is in the eastern part of the Arcadia Management Area and uses parts of the Arcadia Trail and the North South Trail. The hike starts near the top of Tefft Hill on the Exeter/Richmond line and follows trails along the west face of the hill. The inclines and declines are so gradual that they are hardly noticeable. 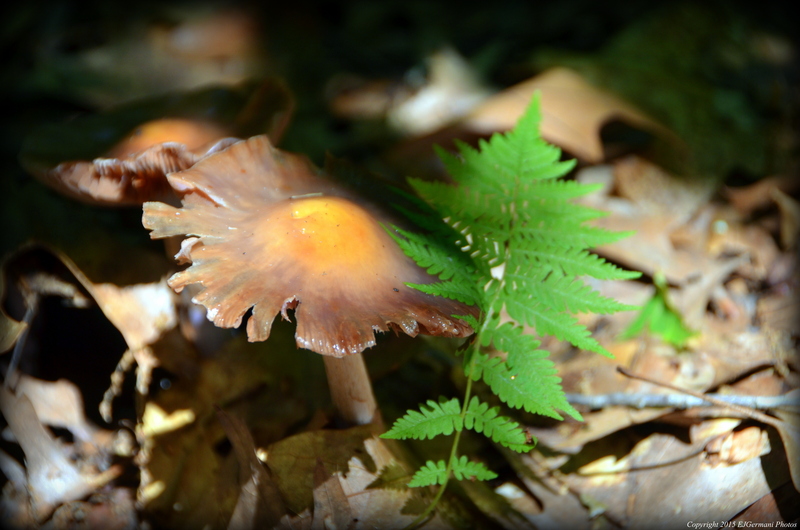 At the time of this hike the mushrooms were just coming into full bloom. We started this hike from the state garage on Route 3 in Exeter first passing a gate at the trail head. The trail is a sandy access road that first crosses under Interstate 95 before heading into the thick of the woods. We turned left onto a white blazed trail passing the first of the stone walls. Ahead we ignored the first trail we passed on the left and then turned left at the next intersection and started following the blue and yellow blazes. The blue blazes are the North South Trail and the yellow blazes are for the Arcadia Trail. For the next couple of miles they run together. At the next intersection the blue/yellow blazed trail turns to the left and heads into Richmond. Ahead is another white blazed trail. That is the Arcadia Crossover Trail and we would return on it. The next stretch of the hike is truly a highlight of Rhode Island hiking. 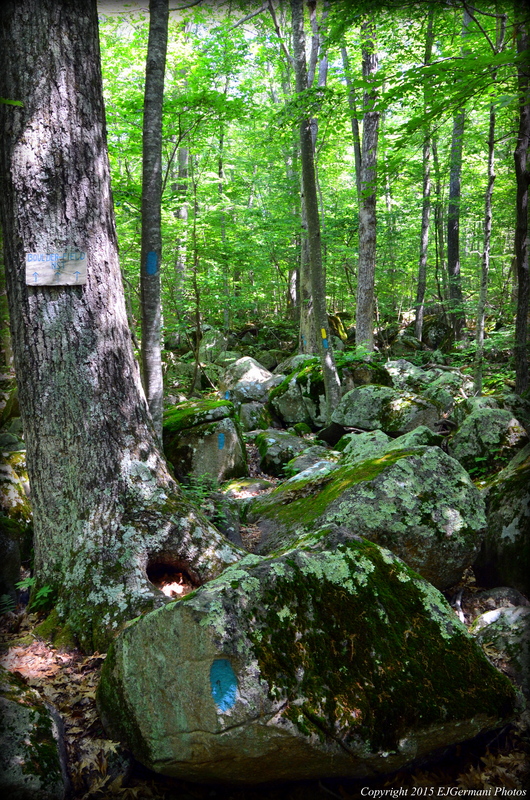 The trail, under a canopy of maple, oaks, and beech trees, meanders through the fern covered forest, boulders, and some cairns. Here we saw many, many mushrooms and plenty of toads. There is even a short and challenging section called the “Boulder Field” in which you need to climb and scramble over boulders. (There is a spur trail here that passes around the boulder field if you so choose to). Ahead is a small stream crossing with the remains of a bridge. In the concrete you will find an interesting display of pebbles and stones placed in the concrete. At the next intersection the blue blazes turn to the left. We followed the yellow blazes to the right continuing to follow the Arcadia Trail. The trail first passes through a beautiful pine grove before coming to an area of stone walls. Next the trail narrows as it approaches a wet area with boardwalks. (The plan was to follow the yellow trail and then turn right onto the white Arcadia Crossover Trail. However we ran across some rather aggressive hornets. With some slight backtracking and some bushwhacking we looped around that area and continued north along the white blazed trail as intended. I will return in the future to re-hike the stretch that we went around). We then followed the white blazed trail as it climbed slightly uphill back up Tefft Hill to the blue and yellow blazes once again. When we reached that intersection we retraced our steps back to the parking area. Trail map can be found at: Arcadia East.